Review date: 5 July 2002. Many of the new PC cases being released by Lian Li these days are only minor variations on one of their earlier products. I checked out four such cases very recently, here. This one, though, is genuinely new. It's Lian Li's entry in the "very very stylish desktop case", or alternatively "computer that won't look too out-of-place among your hi-fi components" sector of the market. There are a few products already in this niche. Cooler Master's ATC-600 (reviewed here) is a standout. But that case is $AU550 without a power supply; Cooler Master cases aren't cheap, here in Australia. $AU550 is a bit much for something with only four drive bays, no elegant way to mount a floppy drive, and space for only a microATX motherboard, if you ask me. The PC-9300 has some of the ATC-600's limitations, but not all of them. And it only cost $AU286 from Aus PC Market when I first wrote this review, in 2002. Now that I come to update the review in late 2005, it's down to only $AU165, including Sydney metro delivery. That price, once again, doesn't include a power supply, and Australian buyers outside the Sydney metropolitan area will need to pay extra for delivery (international shoppers need not apply; you don't want to know what it'll cost to send a boxed computer case to another country). All these caveats notwithstanding, though, the PC-9300 is still about half the price of the ATC-600. And, in some ways, it's a better box. The PC-9300 has a pair of 5.25 inch "external" drive bays - bays with front panel cutouts - just like the ATC-600. There's no groovy plastic door over them, but I can live without that. The PC-9300 has some extras that more than make up for it, as we'll see. The PC-9300 is finished in Lian Li's trademark hard anodised brushed aluminium, which doesn't show finger marks (the bottom and back of the case are just plain aluminium and are easy to leave fingerprints all over, but nobody's likely to see them...), doesn't scratch easily, and looks very nifty, if you ask me. The power and reset buttons are plastic, but they're silver-finished too, and look fine. On the left hand side of the front panel there are a couple of USB connectors, which you can hook up to your motherboard via a pair of four-wire, three-part connectors Your motherboard has to have USB headers (practically all motherboards do, these days), and you have to know the header pinout (but it ought to be in the manual). The ports are USB 2.0 compatible. The front panel, by the way, is trimmed on the sides with the fake carbon fibre that Lian Li use on most of their silver cases. It looks enough like real carbon fibre to be perfectly tolerable, but not if you want your computer to be silver all over. The back of the case reveals that the PC-9300, like the ATC-600, is made for microATX and FlexATX hardware. Very small PSU cut-out, only four expansion slots. 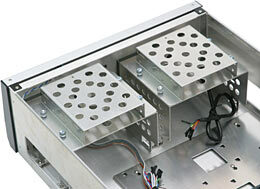 Lian Li have still provided their usual extra ventilation, though; there are two 60mm exhaust fans. And a three-setting speed control switch for them, too; many of Lian Li's bigger cases have this feature on their twin inlet fans. 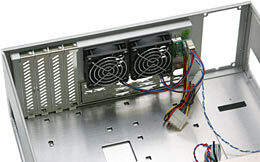 So if you're using the PC-9300 for a medium-power lounge room MP3/DVD/DivX box, you can set the fans to minimum speed, still get perfectly acceptable case cooling, and not hear a thing from the computer. Well, as long as your hard drive, CPU cooler and PSU don't make a racket, that is. 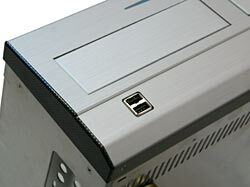 The top of the PC-9300 is held on with a couple of thumbscrews, according to Lian Li tradition. I found it difficult to lift the lid off without scratching the sides of the chassis with the lid's locating hardware. The scratches are only visible when the lid's removed, though, so they're not a big deal. 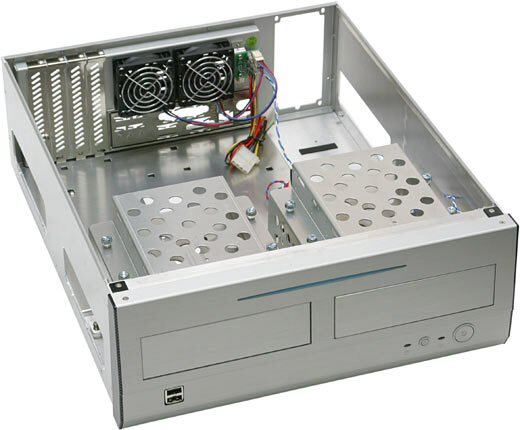 Lift the lid and you see a typical all-aluminium Lian Li interior, only smaller. This little case is easier to work on than you might expect, but without a slide-out motherboard tray it can't help but be a little cramped. There is, however, room for any microATX or FlexATX motherboard up to 244mm (9.6 inches) square, which ought to cover all of them. There's a plethora of standoff mounting points, and enough space between the motherboard area and the drive bays that you shouldn't have any clearance problems unless you're installing weird super-long CD changers, and such. The power supply might be an issue, though. 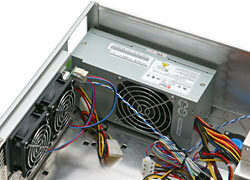 The PC-9300 is made for a tiny little SFX PSU; as far as I know, the only PSUs that'll fit properly are mere 150 watt units. There are more powerful SFX PSUs, but there's more than one SFX shape, and the one that fits the PC-9300 seems to only be available in 150W. This isn't as bad as you might think. 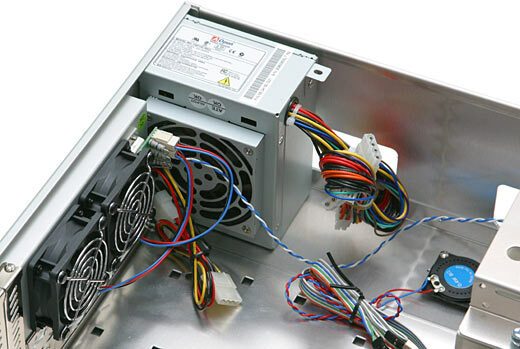 You're likely to find that a fast Duron on an nForce motherboard - which is about the fastest hardware you're likely to want to put in a case like this - will work fine from a mere 150 watt PSU. MicroATX motherboards expect to be running from relatively weedy PSUs. And the usual kind of low-heat lounge room box - a modest Socket 370 Celeron on an integrated motherboard of no particular merit - will have no issues. If you really want to push the performance envelope, though, you might strike problems. It's physically possible to shoehorn a larger 180 watt PSU into the case, but unless you do some power tool work you won't be screwing it in. Double sided tape is wonderful stuff, though. The rear fan speed controller looks like the same unit Lian Li use for their twin-80mm-intake-fan cases, which means it shouldn't be working too hard with these two little 60mm units. For further ventilation, the rear slot covers are, um, slotted. Which probably won't do much, but doesn't hurt. They're retained with ordinary Phillips-head screws, not Lian Li's usual thumbscrews. Deal with it. The PC-9300's two internal 3.5 inch drive bays are held on with thumbscrews; the 5.25 inch bays they're attached to are removable as well. The problem with this layout is that you can't have an externally accessible 3.5 inch device, without extra hardware to put your 3.5 inch device in a 5.25 inch bay. Fortunately, Lian Li throw in that extra hardware. Quite a lot of it, in fact. The PC-9300 bits box contains rather more than the usual screws and motherboard mounting widgets. You also get this little lot. 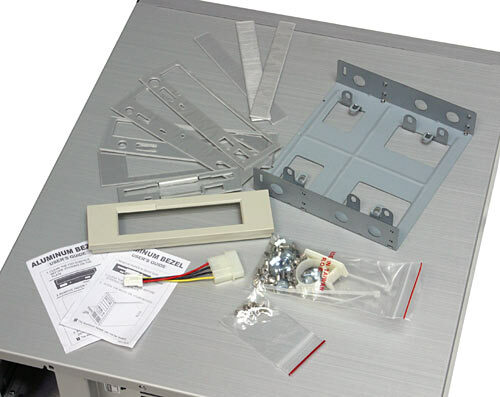 What you're looking at, as well as bagged fasteners and board mounts, is a 5.25 to 3.5 inch adapter, to let you put a floppy or other 3.5 inch device in one of the 5.25 inch bays. And a power connector adapter for a floppy drive, in case your PSU doesn't have a plug for one. And a front bezel to fill the gap around an externally accessibly 3.5 inch drive in a 5.25 inch hole. 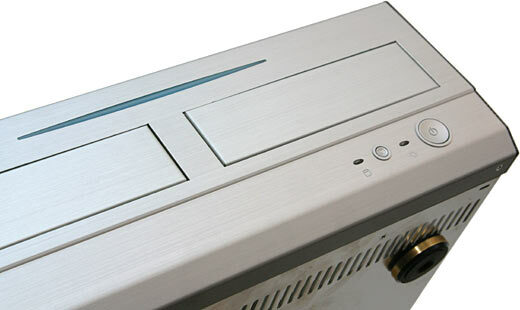 And a stick-on brushed aluminium faceplate to match the bezel, so you won't have to put up with the bezel's beige plastic breaking up your nice silvery front panel. And, to deal with the (probably) beige plastic of the drive itself, there's a stick-on faceplate for it, too. As long as you've got a Teac or Mitsumi floppy drive, it should fit. On top of that, you get three different models of CD/DVD-ROM drive faceplate. Lian Li sell all of these faceplates as separate items; I review them here. They look pretty good, they're easy to apply, and as long as you make sure you buy a drive that they'll fit, they're a great solution to the piebald-computer problem that afflicts everybody whose PC case isn't beige. In the unlikely event that you have a use for all three of the CD-ROM faceplates and the floppy one, by the way, they're worth about $AU60 between them. Within its limitations, the PC-9300 is a very good product. If you want to build a lounge room PC that'll fit in with normal home theatre gear, you want a case like this. But it's also a good choice if you want an unobtrusive and stylish desktop machine, without a whole lot of knobs on. Sure, various brand name computer makers sell machines in this niche, but a PC-9300-based computer will look better and cost less for a given spec level. The PC-9300 is likely to match any swish office's décor, and you can pack a fair bit of power into it. $AU286 wasn't a bargain price compared with ordinary steel computer cases, but at $AU165, you really can't go wrong, if of course this little case actually suits your needs. If you don't care much what your computer looks like, and you don't have to work on it often, there's no point paying the extra for any Lian Li - but there really isn't much extra to pay, in this case. Compared with Cooler Master's ATC-600, the PC-9300 is cheap. And it comes with all those nifty drive-related extras. Am I going to get one? Nope. I don't need a teeny slick-looking PC. Well, OK, I could stand to own one, but only if I could somehow get a normal ATX motherboard into it. That's not going to happen with any of the super-small cases. 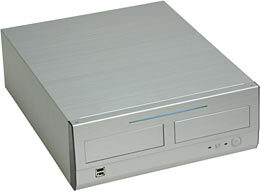 If you are in the market for a small, good-looking case, though, check the PC-9300 out. Aus PC Market don't sell the PC-9300 any more, but they've got lots of other cases!